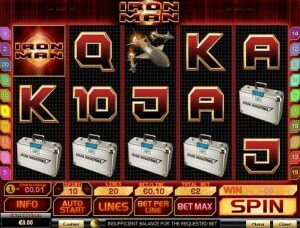 The online slot “Iron Man”, based on Playtech Gaming software, is perfect for the “Iron Man” movie lovers. 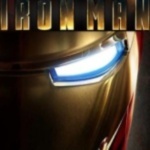 You can play the standard version or check out the new versions “Iron Man 2” or “Iron Man 2 with 50 lines”. 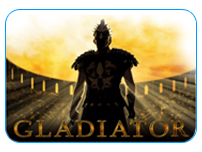 But the original edition itself already makes for an exciting online casino experience. 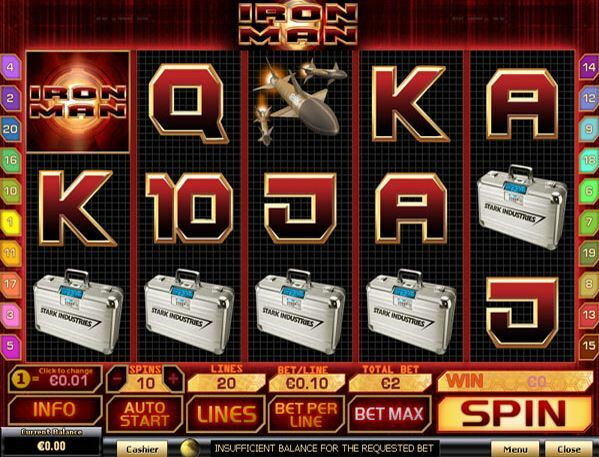 Click here to play Iron Man now, or read this review for full details of this fascinating slot game. In the slot, you find various characters and images from “Iron Man”, for instance the suitcase, the rockets and the Iron Man himself. 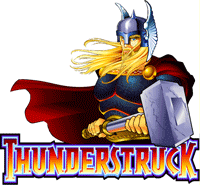 There are also various animations in this game, for instance the Iron Man is seen flying in the sky when a certain winning combination comes up. 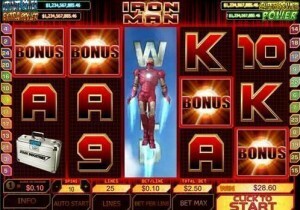 There is a scatter symbol in this online slot, namely the Iron Man logo. If it appears 3 times or more, the “Missile Attack Bonus” starts. Furthermore, both Iron Man symbols are wild card symbols and become extra powerful if they appear in combination. You can play up to 25 paylines; it is possible to choose any number of paylines that you want, up to that number. It is also possible to easily change the bet amount per payline at the bottom of the screen. If the scatter symbol appears 3 times or more, the “Missile Attack Bonus” is activated. In that bonus round, you can win free games, multipliers for free games and also real money. You can also continue winning free games during the free game rounds (10 free games if the scatter comes up 3 times). If the wild card symbol is “stacked”, that is, it appears 3 times on the same reel, it counts as an “expanding wild”. If both Iron Man symbols come up on the reels, you can increase your winnings up to 750 times the bet per line! 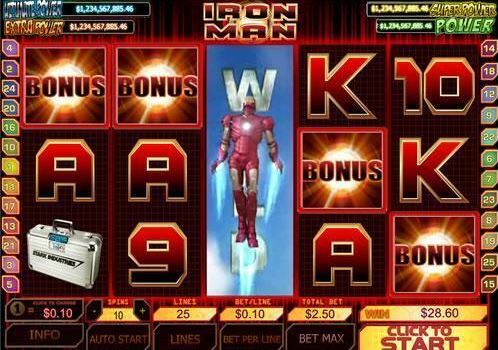 As the “Iron Man” slot is part of the Marvel series, it is also connected to the 4 Marvel progressive jackpots, which means you can win big with this casino slot! The Return-to-Player figure is given as around 95%.